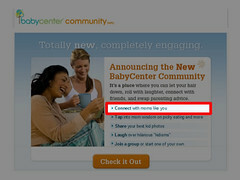 Got this piece of email in my inbox from BabyCenter pimping their new BabyCenter Communities and urging me to join. Because, you know, I need to to connect with Moms – like me. In case you can’t read the line that gaffed me it says “Connect with Moms like you.” Because, you know, Dad’s would never be interested in connecting with other Dad’s to talk about their kids. Now, this isn’t rocket science. When I signed up for my BabyCenter account, I told them I was male and gave them a whole bunch of other information so they could precision target their advertising directly to ME. Dammit – if you are going to collect my private information, at least use it correctly! Who knows? If maybe if it said connect with other Dad’s in the email, I might actually be tempted to check out the community. You can click on the image to see a bigger shot of the email. This entry was posted in The Daddy Fight, Uncategorized and tagged babycenter, Mr. Mom. Bookmark the permalink.